At StoreHippo, we provide support for setting up the temporary password for users. You can enable automatic generation of temporary password when you add a new user. This is particularly important when you are adding multiple users in bulk and want to set a temporary random password for them. The temporary password is available in the user welcome mail notification. Customer will be prompted to change their password when they log in with their temporary password. 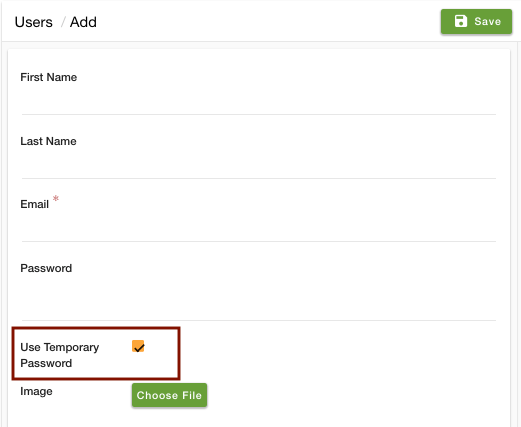 To enable temporary password, go to Users > Users section in StoreHippo Admin Panel and add a new user. If the Use temporary password checkbox is selected and the password field is left blank, then a random six character password is generated automatically and sent to the user. If the password is also specified along with the temporary password, then the specified password is sent as the temporary password to the user. After you set a temporary password, a welcome email with the temporary password is sent to the user. 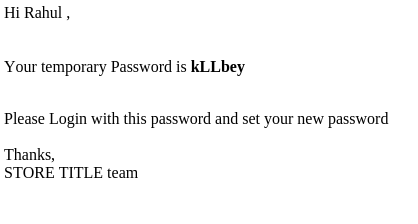 The screenshot below shows the welcome email with the temporary password sent to the user. When the user logs in using the temporary password, the user is redirected to the Change Password page. Existing users usually require the temporary password when they forget their password and request for a new one. To enable temporary password for an existing user, update the user's profile with "Use temporary password" field as checked. A temporary password will be automatically generated and will be available in the change password notification. The screenshot below shows a sample change password email template.